Mostly when we think about social science, we think about small gangs of researchers armed with clipboards and questionnaires. Sometimes they have laboratories and electrodes, but mostly they just want to ask us questions. When I answer social science surveys, I usually assume that the researchers have a hypothesis in mind and that there are good and bad answers. Hard to avoid this and researchers have to be really careful to avoid what is called 'good respondent bias'. This project is different and uses a alternate approach which is more inductive and more emergent. When we started talking about this project and Lucy began preparing a proposal, we just had a sense that it was interesting territory and that there was a good chance a trek across the terrain might involve some interesting encounters. So we are using an approach to data collection that is less formalised and more opportunistics, but which seeks to build a reasonable collage of the dynamics of service design. Officially, we could call it a grounded theory or inductive approach to research. It treats participants in the research project as co-producers of knowledge; researchers might be able to add some linguistic polish or theoretical gloss to the processes and phenomena, but overall this is a joint expedition. 'What is the plural of anecdote? Data'. Wildavsky said this at a meeting somewhere. We are collecting, collating and synthesising data all the way through this process. Flip charts, arguments, lists, observations and arguments (conflict surfaces some of the most important phenomena). We may have to do a few follow up interviews but all these sources will come together over the life of the project. Whereas ethics and technology are usually thought of as two distinct domains – “it is what you do with it that matters!” – there are numerous ways to (re)think the way in which specific products, services included, may afford, pose, resolve, etc. ethical challenges and dilemmas. Most, if not all, technologies depart from the lab/factory with certain assumptions about the environment in which they are going to work, in other words, they depend on and reinforce the existing given moral order. Desert racing has a long history among Bedouin Arabs and remains a popular and lucrative spectator sport. But the use of child jockeys has been condemned by human rights activists, who allege that jockeys - as young as four years of age - have in the past been kidnapped, kept in prison-like conditions and deliberately underfed for racing. The robots were developed after the United Arab Emirates Camel Racing Association banned the use of jockeys under the age of 16 in March 2004. The age limit for jockeys was increased to 18 in July 2005. We can, of course, think of more mundane artefacts, such as energy-saving light bulbs (‘using too much electricity is wrong’), speed cameras (‘speeding is wrong’) and barn eggs (“hens need space”), in similar terms. Does the service you are designing come with moral assumptions? The project sets up a number of ways of capturing at different points the ways that participants conceive of the designing of services, and creates four pairing projects between service design consultancies and science or technology enterprises offering services as a way of studying current service design methods and their effects. In the first workshop, we created two blank posters we called "buckets" which we invited people to make notes on throughout the event. One was a bucket for research questions. Another was a bucket called a "parking lot" for parking important questions. The comments in these buckets are presented unedited here. ⇒	What is a concept? In design, theory, social research, business etc. ⇒	Why “Services” & “Design” now? ⇒	When do we stop designing the research and start doing it? Is there a difference? ⇒	Research methods for the design of services: what is so special? ⇒	To what extent are issues and opportunities associated with this area unique and to what extent an example of / context for more generic issues of management, organisation and design? ⇒	How to establish the sci-tech “intensity” of a service? Is brain surgery really more intensive than serving burgers? ⇒	Can this research capture what it aims at by looking at a fragment of the process? ⇒	Are “services” valued by sci-tech organisations or are they “second-class citizens” i.e. a means to generate cash flow in the short-term? ⇒	Do we need to distinguish between services in sci-tech enterprises that are central or peripheral? ⇒	What is the key constraint to designing services? ⇒	Why only sci-tech services? What characterises them and makes them complex or interesting? ⇒	What are the new ethics of service design practice? ⇒	Is “service design envy” an update on design’s concern for integrity of materials? ⇒	Does “Designing Services” need design skills or are they already being designed? ⇒	“Design” is guilty of shrouding itself in mystery and does a very good job of disguising its real value to organisations and its stakeholders. Is it a useful term for this project or does it make more problems than it solves? And what can we do to minimise the confusion around it and demystifying it in this context? ⇒	What are the language constraints & new language frameworks are needed to communicate between design, business, science & academia? ⇒	What is a “service”? How do you “design” one? ⇒	What is the term, sentence, evidence or unit that will eventually clearly communicate the value of designing services? ⇒	How do service design processes design, mobilise & enact “users”? ⇒	What is the architecture or framework that enables the provision & iteration of service provision? What “ideas” do you expose sci-tech companies to as they move towards a services environment? Can you replicate this architecture in time and place? ⇒	Are existing methods or methodologies ideal – or even adequate – for investigating the questions above? ⇒	What is the role of computer-aided design in designing for services? ⇒	What is the role/scope of complexity research methods in designing of services? ⇒	Is “design” conceived of as something like a ‘discipline’ within both academic and commercial institutions – equivalent to engineering – or is it something else and conceived of as something else? ⇒	Why and how is there something to learn from the design disciplines as concerns service innovation? ⇒	Are there “parts” of services that cannot be designed or is 100% of services designed? Designable? ⇒	To what extent do techniques for designing physical products translate to designing services? ⇒	Do interaction design methods and techniques developed by industrial designers help them to work on service design projects with other disciplines/stakeholders? ⇒	Do methods & techniques used for the design of product/service systems for sci-tech companies work for public sector services? Attentive to the ways that knowledge is produced and authorized, we have included in our project design a simple way to capture and make visible the links between participants. At the first event, on the wall was a large, initially blank poster asking people to draw and write on it who else in the project they are connected to and how. We'll have this representation present - and editable- at subsequent events. Funded by two UK academic research councils, the project's geographical scope is primarily the UK where most of the participants are based. However several of the companies involved are international companies (IBM, IDEO) or have established operations beyond the UK (G-Nostics, Celoxica, livework), while the academics are members of formal and informal networks which have hubs in at universities in North America and Europe. 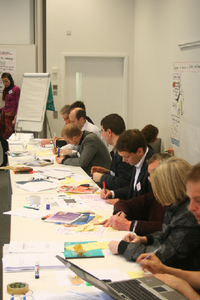 One of the first activities we asked participants to do was to make a cognitive collage to repesent how they currently understand the designing of services in science and technology-based enterprises. We gave them only five minutes to do this - a difficult task, of course, but the limited amount of time available would, we hoped, focus attention on getting key ideas across rather than worrying about the skills in making attractive drawings or collages. After this we asked participants to have two short conversations with others, to share their cognitive collages. The next activity was then to write down on stickies key concepts or questions that were emerging from these representations and conversations about them. We then took turns to stick these up on the wall, putting ones that seemed similar together, reflected on them, and then clustered them. This PDF document contains a fairly unedited version of the clustered stickies. Our first project workshop is over - and now begins the job of digesting what we heard, what we contributed, and preparation for the second workshop on January 29. Around 30 people attended the event held at Saïd Business School from a range of backgrounds and contexts including academia (social sciences, management and design), enterprises and design consultancies. The main research questions of the project are to find out how these different communities of practice and knowledge understand the designing of services in science and technology-based enterprises. 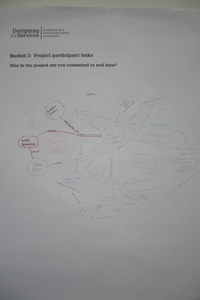 As part of answering these questions, we made extensive use of techniques that involved participants in making representations of their domains of knowledge. For example, ahead of the workshop we sent participants a "cultural probes" pack to stimulate different ways of thinking about the designing of services. Once people arrived at SBS, the first thing they had to do was produce a cognitive collage and share this with other participants. Through these and other methods, the workshop began to build up two key artefacts for the project - helping with sense-making among this diverse, emergent community: a representation of the current state of knowledge relating to the research area; and the beginning of a shared vocabulary. We made use of scribing (or visual facilitation) services provided by Sefi Amir of Design Heroine, photography by Christian Toennesen and video documentation by film-maker Flora Skivington. Angela Wilkison of the school's James Martin Institute facilitated. Selected edited versions of these artefacts will be made public here over the course of the project as we endeavour to share both our research process and our findings.